MARTIN, Benjamin/Samuel Dunn 'A Map of the World on a New Projection with a Delineation of the Various Parts and Phenomena of the Solar System, to facilitate the Principals and Study of Geography and Astronomy'. London: Laurie & Whittle, 1794. 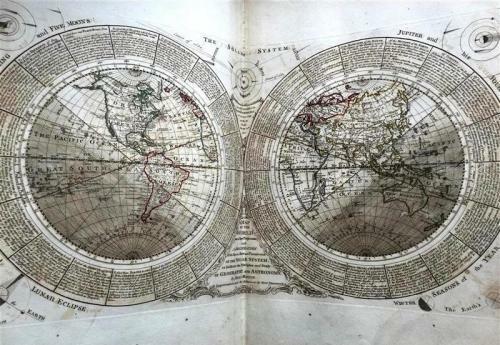 This map is from the famous atlas made by the late Samuel Dunn in 1800 called A New Atlas of the Mundane system or of Geography & Cosmography describing the Heavens & the Earth. The total size of the map page is 23’ x 18” with the printed area 23” x 12” with blank verso. This is a very rare copper plate map in good condition with some age tanning and foxing as you can see in the pictures. This Map is very hard to find for sale anywhere and would be a good addition to any map collection.Each hemisphere is within rings of text explaining how to use the map for various geographical calculations, including longitude, the azimuth of the sun, sunrise and sunset. Around the outside are illustrations of: the Solar System with the paths of the comets of 1680 and 1682; Saturn's Ring and Five moons; Jupiter and his Four Moons; Seasons of the Year; A Solar and Lunar Eclipse. DUNN (Samuel). A new atlas of the mundane system, or of geography and cosmography : Describing the heavens and the earth, the distances, motions, and magnitudes of the celestial bodies : The various empires, kingdoms, states, republics, and islands, throughout the known world; wherein are particularly described the latest discoveries. The whole elegantly engraved on sixty-four copper plates. With a general introduction to geography and cosmography; in which the elements of these sciences are compendiously deduced from original principles, and traced from their invention to the latest improvements. The third edition, with additions, corrections, and very great improvements. By Samuel Dunn, mathematician, and member of the Philosophical Society at Philadelphia in America. London : Printed for Robert Sayer and Co, Fleet-Street, sd .